My son and I love love love the flavor profile of Pho: star anise, cloves, cinnamon, ginger and cilantro in an aromatic broth. Most of the time we order it with beef but once I tried it with chicken I realized it was something I could substitute for regular chicken broth at home. Once I discovered my Instant Pot, I began making bone broths even more often because of the added convenience of being able to do the entire project in one pot AND in a fraction of the time. With a broth like Pho Ga, where you have to char the veggies first, it became an even better candidate for the InstaPot because of the saute option. A few of the ingredients I purchased online: for convenience and for price. I'm sharing those links with you if you need them. This is my own version of the traditional recipe, customized to the palate of my family. For example, I usually don't add sugar to savory dishes. And, I altered the garnishes a bit from the traditional. Buy whatever chicken is on sale. I like to get a whole young chicken or legs/thighs depending on what is the best price the day I go shopping. When serving, I prefer roasted chicken served with broth soups and save the shredded chicken for a different recipe. But you can certainly serve the soup with the shredded chicken instead. 1. 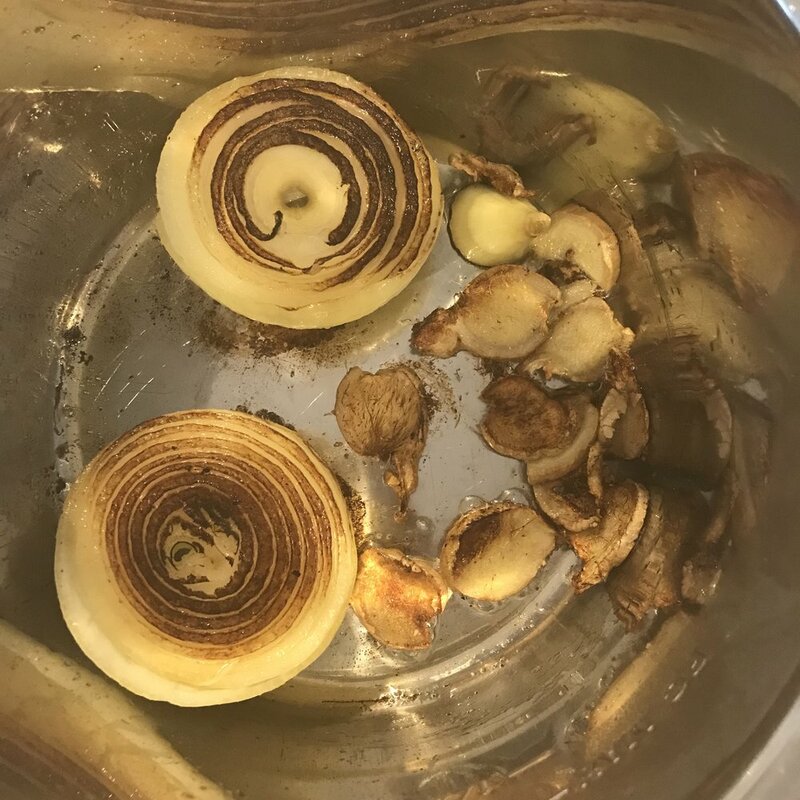 Turn the Instant Pot to saute function and char the onion and ginger slices until dark brown. 2. Add the fish sauce and deglaze the bottom of the pot. 3. Add the cilantro, cinnamon, cloves and star anise. 4. Place the chicken on top of everything else. 5. Add water until almost covered, paying attention to the max fill line on the pot. Do not exceed this line. 6. Close the lid and set the Instant Pot to high pressure for 30 minutes. 7. You can let the pressure release naturally or with the vent. 8. Serve broth over prepared rice noodles with sliced chicken in the bowl. Prepare the rest of the garnishes on a side plate.